eZr™ is a three-step diamond polishing system for the processing of zirconium oxide and lithium disilicate. The grinders and polishers are ideal for adjusting and correcting chairside restorations such as inlays, onlays, veneers and crowns. 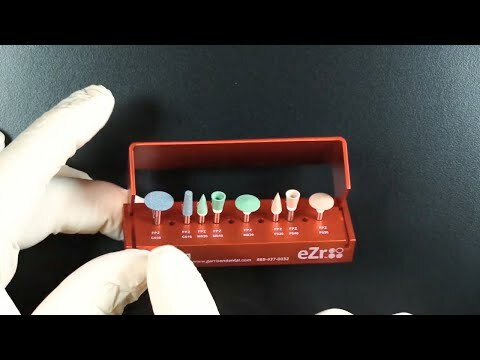 eZr™ produces a high gloss finish on zirconia, the polishers have a long life, and in combination with a high material removal rate, allow for an economic and fast processing system to get to glossy in seconds, without polishing paste. 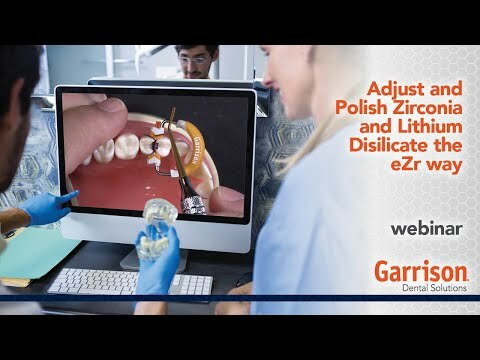 Enables easy and safe adjustment for zirconia and lithium disilicate. Proprietary diamond impregnated polisher reduces the possibility of chipping and microfracturing. Provides an unparalleled smoothly polished occlusal surface, eliminating abrasiveness to opposing dentition. Prevents overheating that could lead to premature failure. Eliminates the need for polishing paste, reducing the overall cost per procedure. "eZr™ is the only polishing system that actually polishes zirconia smooth. Research tells us that zirconia is not over-abrasive to opposing dentition so long as it is polished to smooth. With all the other kits, there are still visible bur marks after polishing. The eZr™ system is the only one I’ve tried that polishes zirconia to smooth!"